Did you know that Army Day and Flag Day are both celebrated on June 14? 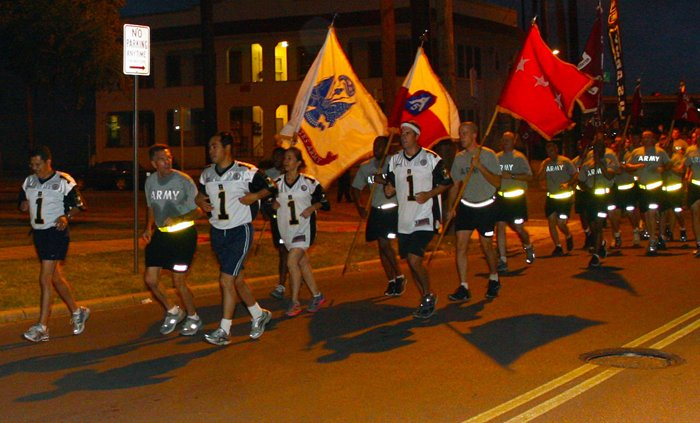 On the morning of June 14 about 6:00am outside of our hotel on the first day of our reunion there were Army Platoons doing PT running in the street between the hotel and The Alamo. Carrying banners, shouting cadence and waking us up. Thanks to a fortuitous early morning walk by Ron and Carol Draper the 2012 Reunion attendees were invited to the Retreat Ceremony In Honor of the Army’s 237th Birthday by the Commanding General of 5th U.S. Army and Fort Sam Houston. 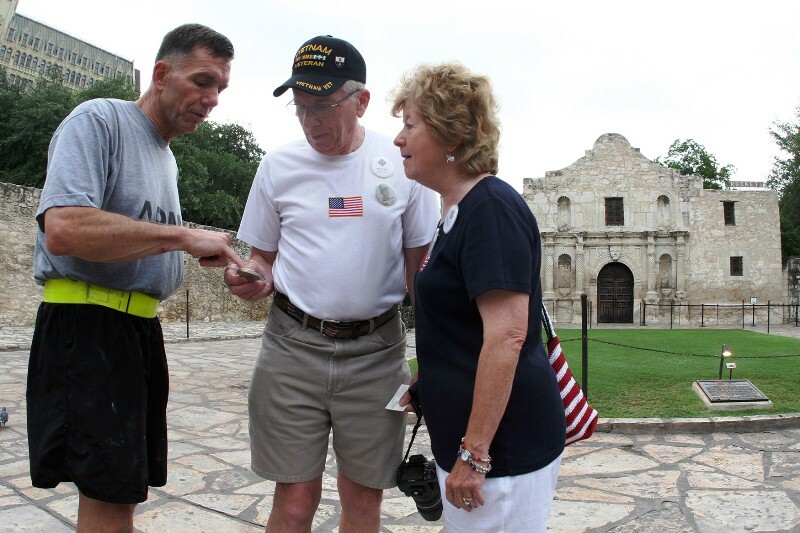 While Ron and Carol Draper were taking an early morning walk around the Alamo they were approached by Lt. Gen. William Caldwell IV, the Commanding General, 5th US Army and Fort Sam Houston when General Caldwell noticed Ron’s Vietnam Veteran cap. General Caldwell and a group of Fort Sam Houston Soldiers were assembled at the Alamo in preparation for a celebratory run to Fort Sam Houston in observance of the Army Anniversary. When General Caldwell learned of our reunion from Ron and Carol he extended an invitation to the entire group to attend the reception and retreat. The retreat was held at the Quadrangle, Fort Sam Houston, Texas which houses the 5th Army Headquarters from 1300 to 1700 hours, June 14, 2012. Several members of the General’s staff and other attendees joined the C/D Company reunion attendees in conversation prior to the ceremony, making us feel welcome and appreciated for our service in Vietnam. It was evident from the conversations we share common experiences regardless of the time and place of our service. The retreat ceremony started with the traditional Streamer Ceremony where Battle Streams for each important action are attached to the US Army flag guidon by a soldier dressed in the uniform of the U.S. Army for that period. Following the invocation and remarks by General Caldwell the Retreat to Colors was held, complete with a gun salute. Following the ceremony we were all invited to the 5th U.S. Army Headquarters for refreshments. General Caldwell personally presented the 5th U.S. Army challenge coin to several attendees. This was truly a unique experience for everyone who attended. Where are the Jungle Boots?